One of my favourite elements of interior design and styling is using fabrics, whether it be upholstery, soft furnishings or window dressings, fabrics can add a real point of interest in a space. I have spent many a happy hour or two looking at fabrics and have a box full of samples in my office. The range of products available is astounding, so many variations in colour, pattern and texture. Fabrics can be really important element in a space. Textured fabrics can add interest in a neutral interior, breaking up a flat use of the same colour. A highly patterned or coloured fabric can make an armchair or sofa a star attraction. Using rich fabrics like silk and velvet can add a feeling of opulence. And so it’s that time of year again. Pantone have officially announced their colour of the year for 2017. In the dark, bedroom makeover. So an on going project in my home is our bedroom. And although the bigger things like bedroom furniture and built-ins are all taken care of, the painting is not! 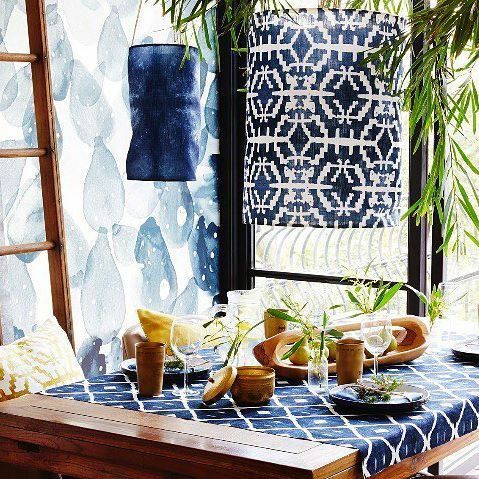 I am totally smitten with the new outdoor fabric range from Thibaut Design in collaboration with Sunbrella Fabrics.